Psoriasis is a common skin disease that can first appear in young adults. People with psoriasis develop sharply outlined reddened bumps (papules) mixed with rounded plaques (thick, hardened circles of skin). The skin is dry and itchy and is covered with silvery scales that easily flake off. The condition worsens then improves over and over again. Elbows, knees, the lower back, the scalp and the palms and soles are areas most affected. Along with chronic inflammation of the skin, arthritis may develop in people with psoriasis. There is no cure for the disease. Treatment includes avoiding dry skin and using a skin cream and/or ultraviolet light. Oral drugs are prescribed to slow skin cell growth in severe cases. Psoriasis first appears as clearly outlined small red papules that eventually form into shiny, silvery scales. Psoriasis is an inherited disease that afflicts all ages and racial groups but commonly first appears in early adulthood. The cause of psoriasis is not understood. The skin’s cell cycle in psoriasis is not normal since skin cells in the plaques grow seven times faster and die much more rapidly than normal skin cells. Psoriasis Triggers: Psoriasis can be triggered by a number of conditions. The disease becomes worse in winter from cold and dry air and improves with warmth and sunlight. Stress, infection and medications, such as lithium and beta-blockers, can worsen symptoms. Often the first outbreak occurs after an infection, especially after a streptococcal or upper respiratory infection. Trauma to the skin can also trigger psoriasis within a few days or weeks. Symptoms: The disorder first appears as clearly outlined small red papules. These papules eventually form into larger plaques that are covered with shiny, silvery scales. 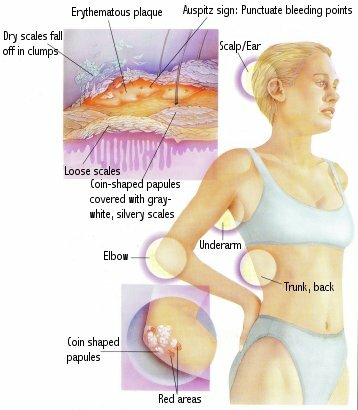 If the scales are removed, light pink skin is seen, sometimes with tiny areas of bleeding. The plaques become thickened depending on their location. Small pimples may be seen in some cases. Regardless of its appearance, psoriasis does not cause permanent scarring. The goal of treatment is to clear the areas affected, but this is not always possible. And many of the drugs used to slow cell growth in the skin have serious side effects. These drugs are reserved for severe cases. Therapy: Treatment includes avoiding dry skin, and use of light therapy or drugs to slow skin cell growth in severe cases. Because there is no cure for psoriasis, drugs must be safe to use over long periods of time. The drugs used to treat the condition are topical (applied to the skin) or systemic (taken orally). Topical drugs include moisturizers to keep the top layer of the skin from drying out, scaling and itching. Moisturizers are applied three times a day for continuous effect. Coal tar slows down cell growth and thins the top layer of the skin. However, its odor and staining properties present a problem. Coal tar is used as a bath, shampoo or a nighttime ointment. Anthralin cream also slows down cell growth, but causes skin irritation and staining. Steroid creams, ointments, gels, lotions and sprays are all used to treat psoriasis, although their action is not well understood. When used over a long period, steroids can cause permanent changes in the skin’s appearance. They can also be absorbed into the bloodstream and cause systemic side effects. They seem to work best when used with other treatments that help to prevent side effects. Systemic treatments include phototherapy, methotrexate and retinols. Phototherapy involves ultraviolet light treatments with methoxsalen, an oral drug taken about two hours before light treatment. This combination is very effective in controlling the condition. Methotrexate acts on skin cells to slow their growth. Etretinate, a retinol related to vitamin A, is also used; however, it causes softened nails, hair loss and peeling of the palms and soles. Because of their toxicity, all of the systemic drugs are used with caution in selected patients who have severe psoriasis that is not controlled by the topical treatments. Although there is no cure for psoriasis, treatment can be effective in clearing the problem so that patients can live without embarrassment or worry. If you have any questions about psoriasis and its treatment, ask your doctor or pharmacist.